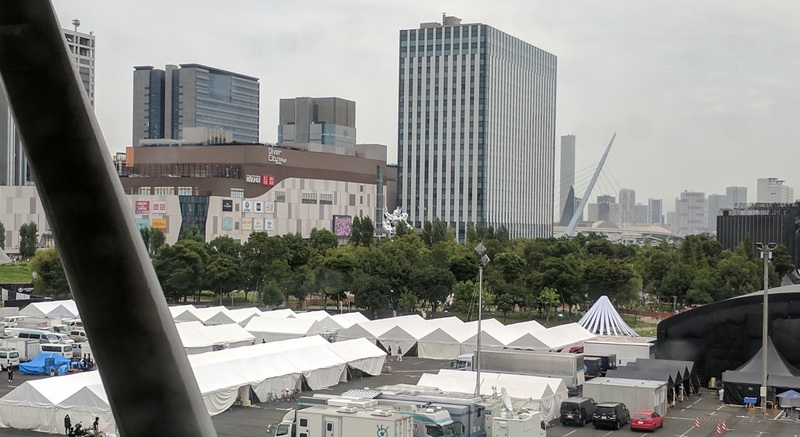 I yolo’d to see the Million Live concert at Nakano Sunplaza last weekend, but while in Japan (for ~28 hours) I also caught two other shows, so I just want to talk about them a bit. It’s going to be mostly on the Shinso Ongaku Ensoukai and a little on WUG 4th final stop @ Zepp Tokyo. WUG is kind of a known thing at this point, so I want to focus more on the less known thing. But let’s start with the WUGchans. During the earlier session May’n dropped by and did One in a Billion, which was nice, but I was still on my way from Haneda Airport at around that time. Maybe I was in the immigration line? Anyway, I had a good gap of time waiting for the early show to finish so I made my way to the Unicorn, while enjoy crowd viewing of Ultra Japan. I guess Porter Robinson was there Sunday? I’ve not been to Odaiba since years ago, so this was nice. The setlist for the night show is on Aniuta, while the afternoon setlist is here. Have to say, it’s quite the gap since Osaka for WUG 2nd, the last time I attended a WUG solo live. Shinso Ongaku Ensoukai is a series of lives presented by Lantis. The comparison I’d make is Shinso Ongaku Ensoukai is the anti-Anisama. The Ensoukai is a fairly intimate live house setting, playing songs that are more “music” than “hype.” It’s about anisong and music and vocals and all that jazz, minus actual jazz? TURE and Mia Regina are the two guests at this iteration, as fhana and Choucho are kind of the organizers for this and appeared at every one so far. Check this phat set mang. Mia Regina aside (more on that later), it’s quite something to see fhana, TRUE and Choucho in this setting. The crowd is unlike Anisama, the atmosphere and the mood are entirely not like medley fests. The artists also bring out their big guns. For example, Choucho’s backing band contributed to the baseline to Outside of the Melancholy, which is now a treat since fhana doesn’t play it as often, and it sounds like a whole new song. TRUE herself did three acoustic arrangements (Unisonia (from Buddy Complex), Steel-鉄血の絆- (from Iron-Blooded Orphan), Divine Spell (from Regalia Three Sacred Stars)) plus the pit-rushing experience that were Butterfly Effector and Soundscape (which she ended on). I was probably most hyped about IBO and Sukasuka ED, as hearing a lot of these from a live house setting really showed off her voice a lot more. I mean, TRUE is a good example because I still freshly remember her set at Anisama, and it deliberately missed Sukasuka ED because whoever that was decided to not have a sad song in the mix of things, and she only have so many slots to work with anyway. For someone who casually knows her song from anime, hearing them like this was a great treat. Choucho was pretty much what you expect, but she played mostly just her new stuff. For “encore” (we didn’t really have one) it was a group rendition of Starlog, featuring fhana–mostly Sato’s keyboard and Kevin’s xylophones I guess, although Yuxuki did do the guitar bridge thing–and the rest on vocals. fhana themselves played their key tracks, with Reaching for the Cities being the most notable contribution. It’s also the one song I wanted to hear, anyway. Their sets ended with the sold-out livehouse trying to dance to Aozora Rhapsody, which was something to experience in the flesh. To me this was a bit of an eye opener. Seeing fhana in a live house setting is the best avenue, and in this example it is amplified a bit by the high energy and yet more laid back atmosphere. I mean, during TRUE and fhana’s sets people were literally bouncing madly at times, and it got a bit moshy even during TRUE’s set, even if it’s just the front. Then you can whip out Choucho’s Fate/Kalied liner movie tracks and be delighted. It’s also quite revealing because the vocalists were front and center of their acts (fhana excepted), so TRUE and Choucho were not overwhelmed by the larger ensembles that they perform in at times, and rather it’s the reverse in how their wonderful voices can fill the house and let the audience swim in it. This is the the reason why I’m dying to make a pun with 深層マーメイド. On that note, Mia Regina opened the show. For people unfamiliar, they are a Lantis vocal unit, with ties to Dear Stage and STAR ANIS. In Mia Regina, they’ve written a few songs for themselves as well. Honestly I’m rather unfamiliar with them too, and found out about them via Sacred Slayer Matoi. It’s definitely their most recognizable song but their CD sampler showed a lot of range and promise. Compared to the usual idol units Mia Regina is definitely…kind of not? They are more vocal and music oriented, so they sounded quite formidable in person and a lot closer to what you’d think a vocal-first group would be. I don’t want to drop names but they remind me another three piece vocal group that do harmonies, minus the high budget polish. Mia Regina do dance, though, thanks, Dear Stage. Would I fly for this? No, probably not, but I definitely would attend if stars ever align again. This is the kind of anisong event meant for people who enjoy music the old fashion way, and if the right kinds of artists are going to bring their A game I think it will be a great show every time. This entry was posted on Monday, September 18th, 2017 at 5:57 pm and is filed under Conventions and Concerts. You can follow any responses to this entry through the RSS 2.0 feed.